I came to Jackson as a wide-eyed east coaster obsessed with skiing feeling like I just found my paradise. Long steep descents, cliffs, chutes, powder, and beer. Skiing was life and after a two winters of trying to keep up with the boys, I landed my first sponsor. I lured them in with a ski resume of all the rad lines I skied in the JHMR backcountry and a thumbs up from one of their seasoned ambassadors. Even though I signed myself up for this sponsorship, at the time I had no clue what it entailed. I just thought they sent me skis because I was a rad skier! As the years went on, I began to mimic the actions of other sponsored skiers by building a website, posting my adventures on Instagram, and reaching out to photographers in hopes of getting my photos in a magazine. But through all this, I never truly understood or embraced my role/job as a sponsored skier. Misinformed about what a professional skier was, I became frustrated that flirtatious women who showed off their bodies on social media were getting more media coverage and sponsor support than the hard charging female skiers I admired. This frustration was misplaced. As the years went on, my frustration dissolved as I came to realize professional skiing is not just about skiing. I’ve come to identify three elements which must come together for a successful professional skiing career: (1) skiing ability; (2) who you know; and (3) business. Phenomenal skiing ability is a still a pre-requisite for being considered a professional skier. Pushing the sport is key, but solid skiers are easy to find. 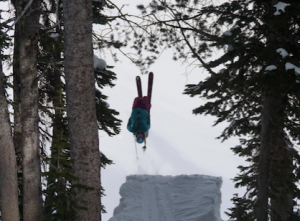 Every Alta, Jackson, and Squaw Valley of the world has dozens of kids skiing pro-level lines and throwing cork 9s. For the sponsors, this abundant talent means skiers they sponsor come cheap, and can be replaced easily. Second, who you know and industry connections can often outweigh skiing talent. I found opportunities will present themselves differently depending on who your sponsors are and which photographers you work with. Magazines tend to publish photos that promote the brands that spend a lot of money on ads in the magazine pages. Often a well connected friend mentions your name when a sponsor is seeking an athlete and a you get picked up or you meet a photographer that you travel well with and end up getting invited on trips because you’re easy to get along with. I’ve found for myself and other pro freeskiers, opportunities serendipitously shake out when an athlete connects themselves strategically. gear, and communicating your mission in a way that sets you apart, inspires your audience, and results in sales for your sponsor. It’s key to understand what your sponsors value and expect from their athletes to ensure your are worth their investment. Early on, I was present on Instagram and kept a blog, but I saw social media as a way to showcase my skiing and missed the opportunity to go deeper to tell my personal story and create a personal “brand” as an athlete. I didn’t see social media as a tool to inspire my followers not only to ski, but also consider my sponsor’s gear. This was a surprisingly difficult question to answer. When I began skiing, my dream was to work with ski industry veterans, go on magazine trips, and get paid by sponsors. As I slowly started achieving those goals, it didn’t feel that great. I lost my sparkle for skiing, began to feel lethargic, and stopped trying to progress. This summer I took up mountain biking and it renewed my passion. I itched to bike every day so I could get a section of trail I’ve only walked in the past or cut a few seconds off my climb time. I became a consumer of mountain bike media and got inspired by women greasing trails that I’ll probably never get good enough to ride. I ski to challenge myself. To overcome the fear I get from standing on top of a big cliff or a run in for a jump. To try my best and push my limits. Even if I fall, the satisfaction of going for something scary makes my day. I think women are especially ruled by their fear and lack of confidence in their skills. My goal is to inspire girls to face their fears, go outside their comfort zone, let go of the fear of failure, and surprise themselves. Turns out, professional skiing is much more multifaceted than I originally estimated. It’s a balance of physical strength and technique, social skills, and business savvy. Certainly this juggling act is not for everybody, lots of skiers prefer to fly under the radar, but if you want to make it as a pro, I think it’s important to remember that at the end of the day, the ski industry is a business like any other.